Twomey says nothing will happen until the law is changed. Vera Twomey.speaks to the media after her walk to the Dáil from Cork. MOTHER AND CAMPAIGNER Vera Twomey is to hold another protest outside the Dáil saying that “nothing else will do” except new legislation in the area. Twomey, who has come to national prominence for her campaign against what she sees as the denial of treatment for her daughter Ava, says Irish laws makes doctors reluctant to apply for a special dispensation. Ava suffers from a rare form of epilepsy called Dravet’s syndrome and her condition has been treated and has been dramatically improved by the use of cannabis-based CBD oil. Vera Twomey wants her daughter to have access to a stronger product containing THC. Tetrahydrocannabinol, or THC, is the substance in cannabis which gives the high but at low levels has been shown to be useful treating conditions such as Ava’s. But since THC contains psychoactive elements, it falls under the Misuse of Drugs Act and is therefore, illegal. “It’s just an extension of the CBD and, in the small percent that you require it, it’s a necessary addition to improve her situation and that’s really what our fight has always been about,” Twomey told TheJournal.ie. As this explainer points out, the Minister for Health can grant a licence for access to cannabis for medical purposes in individual cases when an application is endorsed by a consultant “who is responsible for the management of the patient”. In the specific case of Ava Twomey, her consultant has so far not sought this licence from Minister Simon Harris. “The public neurologist says there was a lack of public evidence and that she couldn’t oversee Ava’s care because there’s a lack of expertise in the country,” Twomey says. 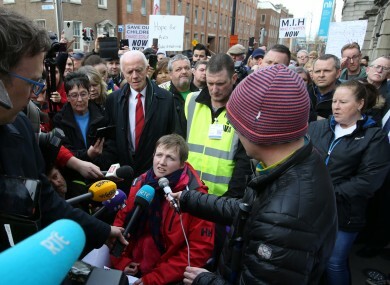 After her march to the Dáil, Vera Twomey said she was given a number of other options in order to obtain the treatment. These included travelling abroad. “The second neurologist said she could send us to Canada to be seen by a neurologist there and they would be able to prescribe the medicinal cannabis for Ava but unfortunately Ava wouldn’t be stable enough to travel a long distance like that,” Twomey says. She added that another neurologist in Cork was willing to oversee Ava’s THC-based treatment but wanted the support of a colleague in doing so, but this was not forthcoming. Twomey says the problem is that the laws make doctors unwilling to look at new options. That is why she says passing the Cannabis for Medicinal Use Regulation Bill is the only way forward. The bill has passed the first stage of the Dáil but has since stalled. “Nothing else will do, nothing else at this stage will do,” Twomey says. I mean Paul, my husband and I, have exhausted all avenues and every suggestion or every attempt to make progress that we have tried has been blocked. And my daughter is in seriously in need of this medication. Twomey’s protest will take place at the Dáil on Wednesday 29 March and will begin at 7pm with people assembly there from about 5pm. Email “'My daughter is seriously in need of this medication' - Vera Twomey is coming back to the Dáil”. Feedback on “'My daughter is seriously in need of this medication' - Vera Twomey is coming back to the Dáil”.